Buying a new house can conjure a special mix of nerves, excitement — and dread. Yet, the inspection, the loans, the envisioning of a new future, and the prospect of transforming your new house into a ‘home’ can be exciting. So in How to Buy the Right Home Furnishings, Part 1, you’ll get a few tips on finding the right home furnishings to turn your new house into the cozy home you’ve always been dreaming of. Every homeowner has the ‘essential’ furnishings in mind. And the trick is to simply narrow the field to a select number. So try to secure four to six furnishings that are ‘must-haves.’ And these ‘must haves’ might be a plasma TV stand, bedroom dresser, living room sofa set or toy chest. So simply create a list. And make sure to prioritize your list. Then, stick to it! And you’ll be surprised how helpful it can be to clearly articulate and define what exactly you’re looking for. In the world of home furnishings, it might be tempting to consider the visual appeal of furniture to be a major indicator of quality. Certainly genuine woodgrain, eye-catching designs and trendy hardware are important. But furniture buyers also need to consider whether a piece of furniture is made from solid hardwood or substitute items like veneered particle board, plastics or other forms of man-made materials. This is why furniture buyers need to consider solid wood furniture from Brandenberry Amish Furniture. 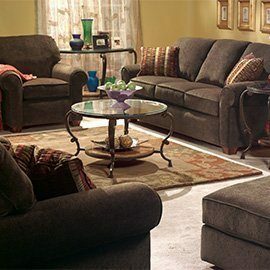 Simply stated, this furniture represents the pinnacle of quality. For example, the Amish craftsmen who build Brandenberry’s furniture use solid Midwestern hardwoods like oak, maple, cherry and hickory. So you won’t find bargain substitutes like veneered wood or cardboard. Nor will you find particle board, brads or nails. For more tips, check out How to Buy the Right Furnishings, Part 2.